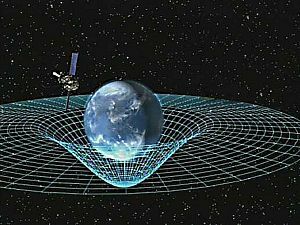 According to general relativity, gravitational radiation is generated in situations where the curvature of spacetime is oscillating, such as with co-orbiting objects. As of 2019[update], the gravitational radiation emitted by the Solar System is far too small to measure; however, on 14 September 2015, LIGO registered gravitational waves (gravitational radiation) for the first time as a result of the collision of two black holes 1.3 billion light-years from Earth. This observation confirms the theoretical predictions of Einstein and others that such waves exist. It also opens the way for practical observation and understanding of the nature of gravity and events in the Universe including the Big Bang. It is believed that neutron star mergers and black hole formation may also create detectable amounts of gravitational radiation. 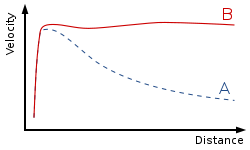 Prior to LIGO, gravitational radiation had been indirectly observed as an energy loss over time in binary pulsar systems such as PSR B1913+16. ^ "HubbleSite: Black Holes: Gravity's Relentless Pull". 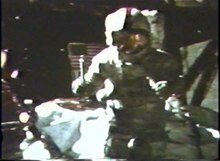 hubblesite.org. Retrieved 7 October 2016. ^ Vitruvius, Marcus Pollio (1914). "7". In Alfred A. Howard (ed.). De Architectura libri decem [Ten Books on Architecture]. VII. Herbert Langford Warren, Nelson Robinson (illus), Morris Hicky Morgan. Harvard University, Cambridge: Harvard University Press. p. 215. ^ Pickover, Clifford (16 April 2008). Archimedes to Hawking: Laws of Science and the Great Minds Behind Them. Oxford University Press. ISBN 9780199792689. ^ M.C.W.Sandford (2008). "STEP: Satellite Test of the Equivalence Principle". Rutherford Appleton Laboratory. Archived from the original on 28 September 2011. Retrieved 14 October 2011. ^ "Gravity and Warped Spacetime". black-holes.org. Archived from the original on 21 June 2011. Retrieved 16 October 2010. ^ Dmitri Pogosyan. "Lecture 20: Black Holes – The Einstein Equivalence Principle". University of Alberta. Retrieved 14 October 2011. ^ "NASA's Gravity Probe B Confirms Two Einstein Space-Time Theories". Nasa.gov. Retrieved 23 July 2013. ^ Bureau International des Poids et Mesures (2006). "The International System of Units (SI)" (PDF) (8th ed. ): 131. Retrieved 25 November 2009. Unit names are normally printed in Roman (upright) type ... Symbols for quantities are generally single letters set in an italic font, although they may be qualified by further information in subscripts or superscripts or in brackets. ^ "SI Unit rules and style conventions". National Institute For Standards and Technology (USA). September 2004. Retrieved 25 November 2009. Variables and quantity symbols are in italic type. Unit symbols are in Roman type. ^ Clark, Stuart (11 February 2016). "Gravitational waves: scientists announce 'we did it!' – live". the Guardian. Retrieved 11 February 2016. ^ Brans, C.H. (March 2014). "Jordan-Brans-Dicke Theory". Scholarpedia. 9 (4): 31358. arXiv:gr-qc/0207039. Bibcode:2014Schpj...931358B. doi:10.4249/scholarpedia.31358. ^ Horndeski, G.W. (September 1974). "Second-Order Scalar-Tensor Field Equations in a Four-Dimensional Space". International Journal of Theoretical Physics. 88 (10): 363–384. Bibcode:1974IJTP...10..363H. doi:10.1007/BF01807638. ^ Milgrom, M. (June 2014). "The MOND paradigm of modified dynamics". Scholarpedia. 9 (6): 31410. Bibcode:2014SchpJ...931410M. doi:10.4249/scholarpedia.31410.